“It might make one in love with death, to think That One Should be buried in so sweet a place,” wrote Shelley, not long before he drowned and was buried here. 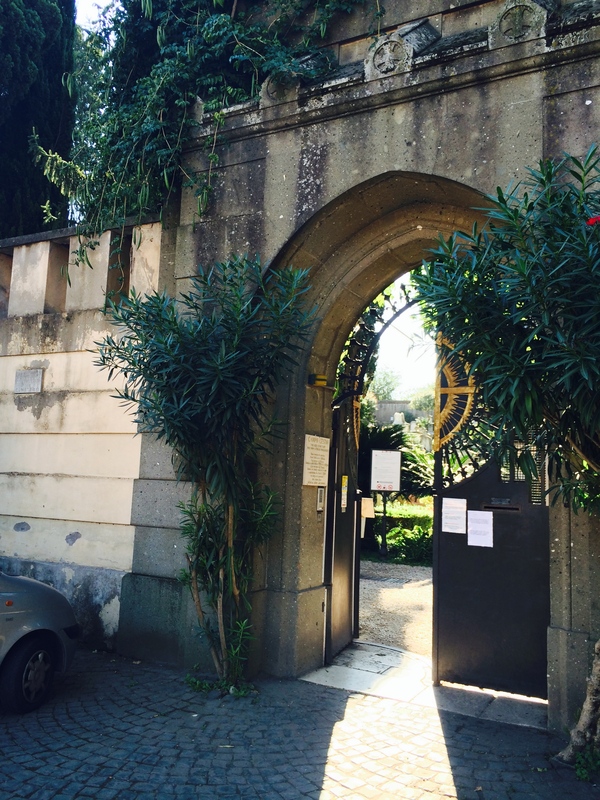 With Halloween quickly approaching, I thought it would be appropriate to share my experience in one of Rome’s famous cemeteries. 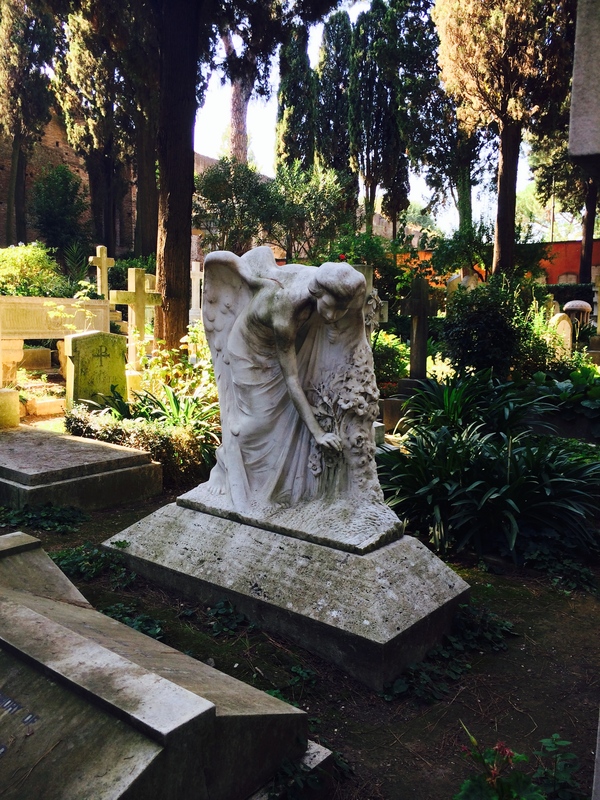 Nestled deep in the Testaccio neighborhood of Rome, the renowned Non-Catholic Cemetery for Foreigners is believed to contain the highest density of famous and important graves anywhere in the world. It is one of the oldest burial grounds in continuous use in Europe. Also known as the Protestant Cemetery, it is nearly 300 years old. I arrived one Autumn morning on foot after following the Tiber River southward from the Pantheon. As I entered through the gates, I was taken by surprise at the quiet peace and beautiful vegetation among the tombs. Although I had creepy on my mind, the fresh morning light and menagerie of resident cats made it much less so. However, this is one cemetery I would not care to venture into at dusk. 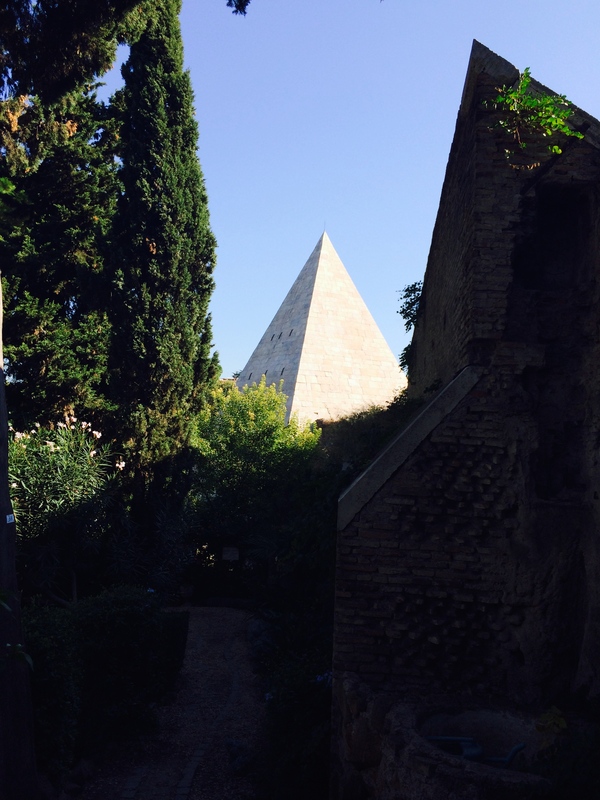 The graves lie under the shadow of the Pyramid of Caius Cestius, constructed in 13 B.C., a magistrate of ancient Rome. Although little is known about him, he was infatuated with Egyptian monuments, as were many of his time. A praying angel lies on top of a grave bordered by white flowers. Many sculptures accent the grounds and bring a sense of sadness. 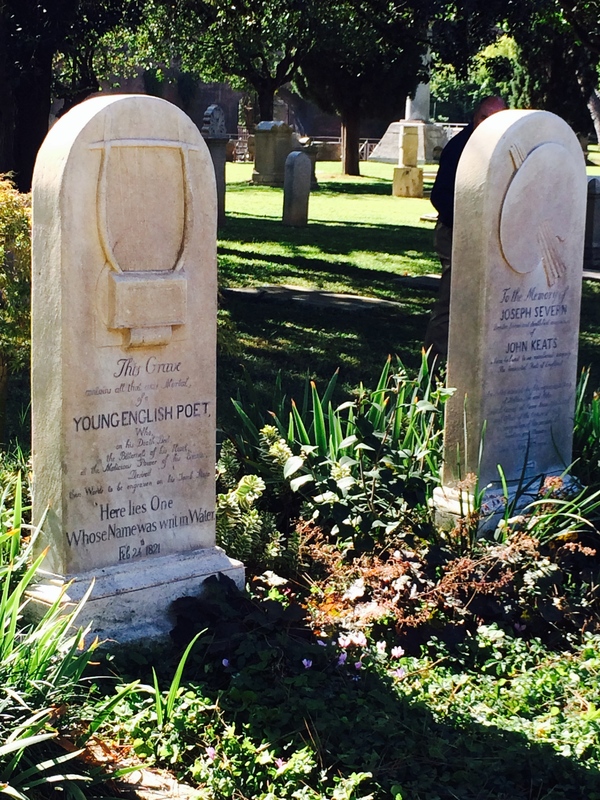 The young 29-year-old poet Shelley, who drowned in the Bay of Poets, is buried here along with Keats, who died of tuberculosis in Rome at the age of 25. Many other famous painters, sculptors, authors, scholars and diplomats have found their resting places here. Goethe’s only son lies among the many. Those of different faiths, such as Muslim, Buddhism, Islam, Zoroastrianism, Confucianism and atheists are buried here. There are over 15 languages inscribed on the headstones and tombs. Below is a strange photo that I can’t quite explain. In the center appears to be a cat standing on it’s hind legs. It looks a bit odd, but not sure what is happening here. 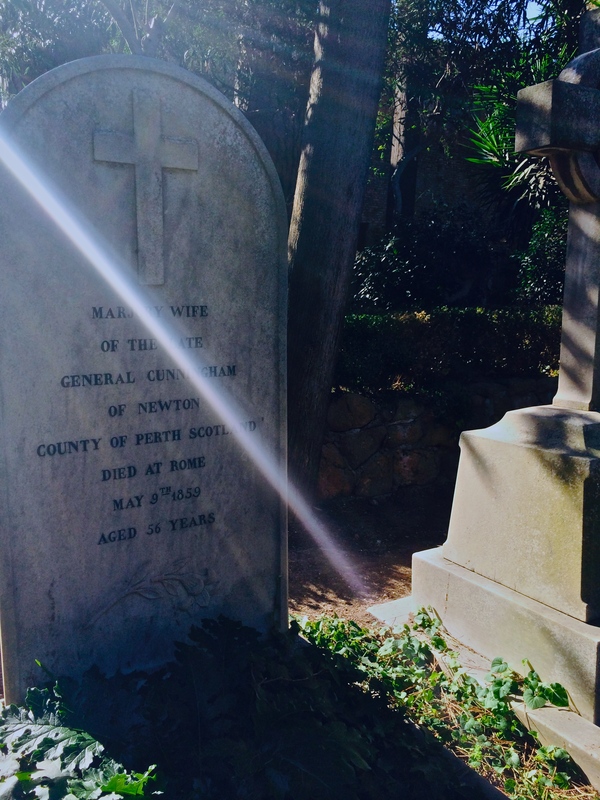 Sun beams cross some of the graves like long columns of brilliant light. Pathway between graves that lead up to a large tomb. 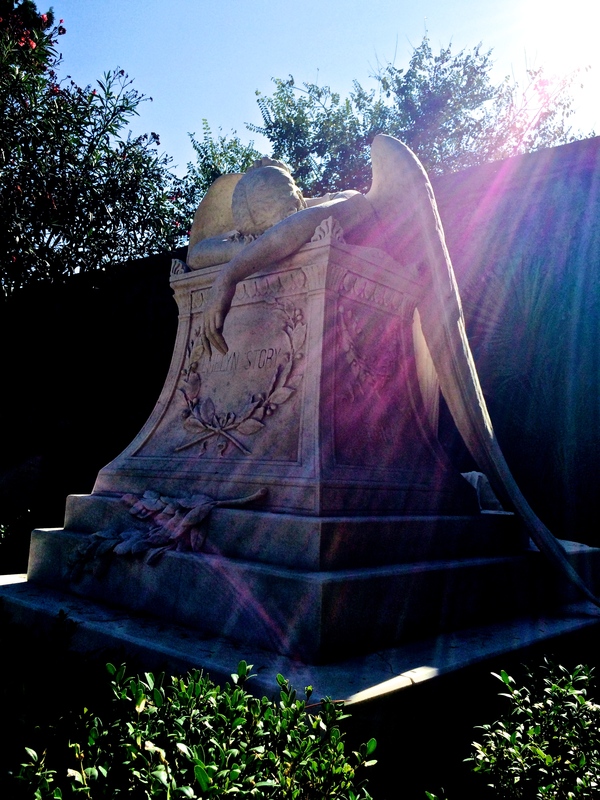 Below is the famous Angel of Grief, sculpted by William Story, an American sculptor, for his beloved wife Emelyn. This is one of the most emotional statues I have seen. 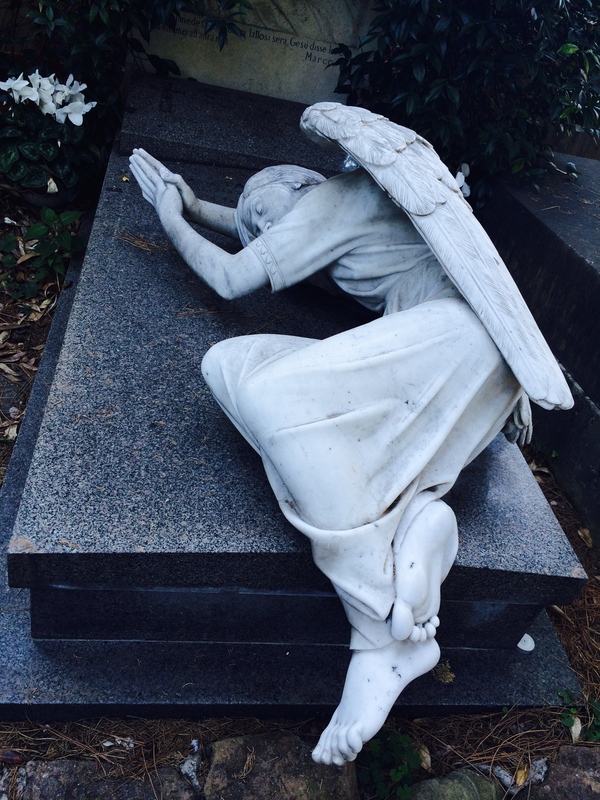 The angel appears to be sobbing in despair over Emelyn’s grave, as if giving up. Could it be that what the angel could not protect in life, it has determined to accompany in death? 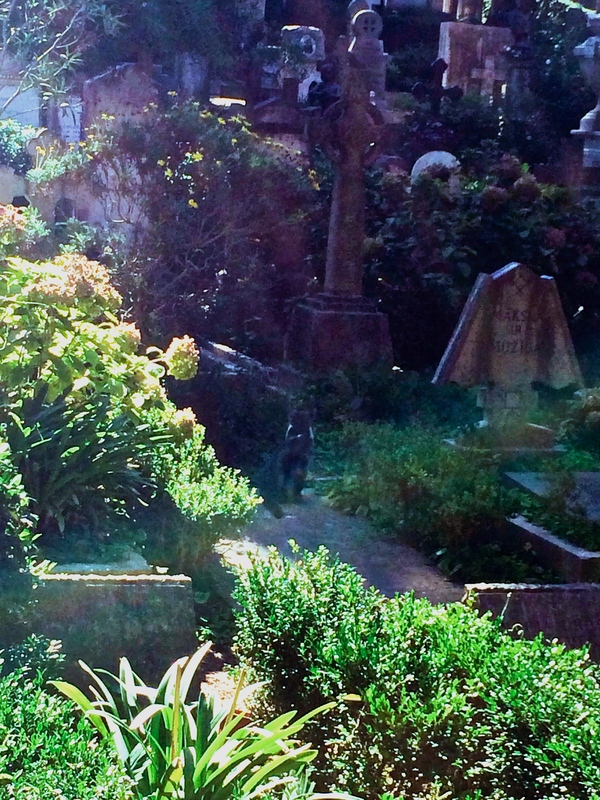 During the daylight, the Protestant Cemetery is a lovely oasis away from Rome’s big-city chaos. But after nightfall, I can’t guarantee it. Thanks for this! I am a cemetery walker from way back –but always during the day! As I am planning a small tour to Rome in May, this will be an optional walk for sure. I also love Pere Lachaise in Paris and Mount Auburn in Cambridge (MA). I, too, love these old cemeteries. 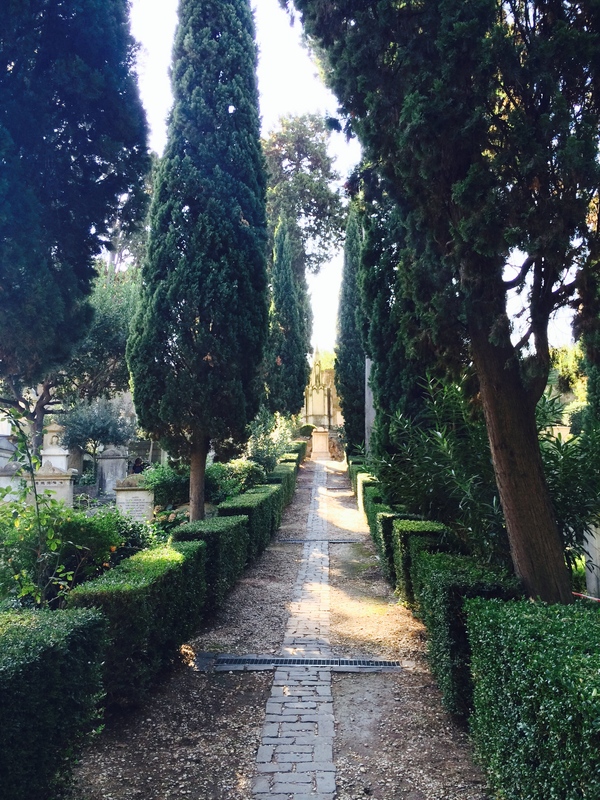 If you go to Florence there is the San Miniato al Monti cemetery that is pretty incredible too…maybe even more so:) Happy grave walking! Yeah, I hope that is what it is….really strange looking:) Ciao Cristina, thanks for stopping by! I have a thing for cimiteri too-in the daytime, of course. I’ve gone past Pyramide loads of times but never stopped at this cemetery, although I’ve heard about it. Too much to see in Roma! Yes there is…Rome is saturated with many things to see and do. I finally made the time to see this cemetery…but so glad I did. One has not lived a full, thorough life unless one has visited and explored Italy. Susan! One of my favorite places to visit. 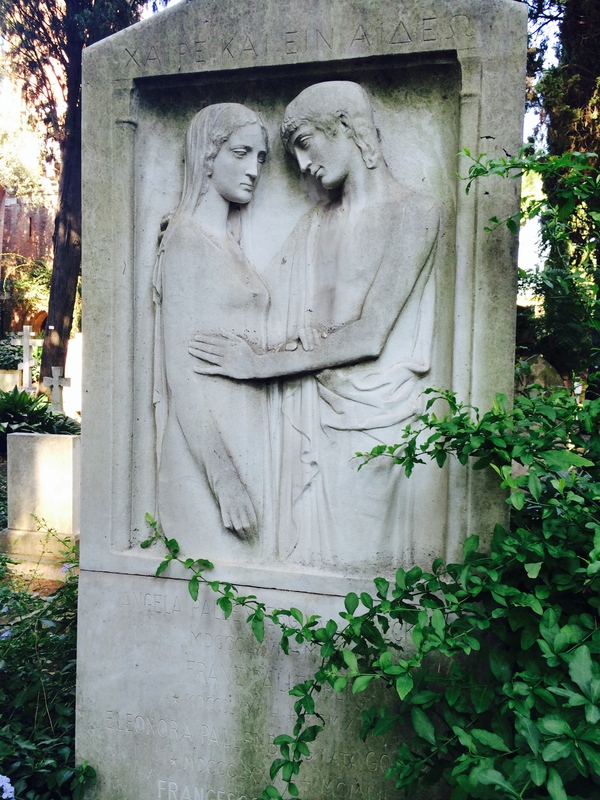 I love cemeteries and have been wanting to do a post on them for some time. 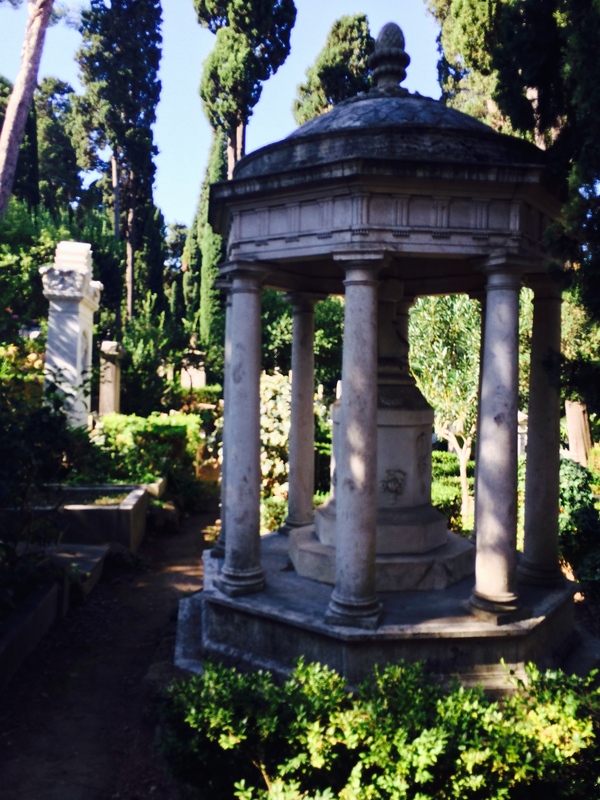 Oddly enough…..I love the cemeteries and am in Rome often, but have never been to any of these. They are beautiful! 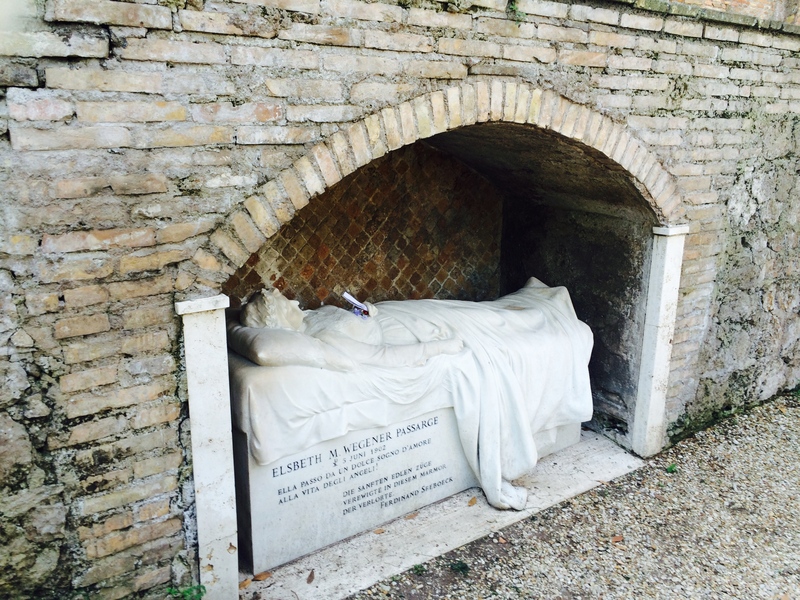 I find them peaceful as well….and in Italy, you find some amazing sculptures! Love shots. ‘Here lies one whose name was writ on water’ sticks in my head from study of Keats! Have driven past the pyramid but never got up close to it or the cemetery yet. You’ve made it a much more real place Susan, but like you I wouldn’t fancy being caught there at night! I will have to go here the next time I am in Rome. Thank you gor this information. I would never think og venturing to a cemetery alone, Susan! I get spooked easily. This post is very interesting and you are so gutsy 😀 BRAVA! 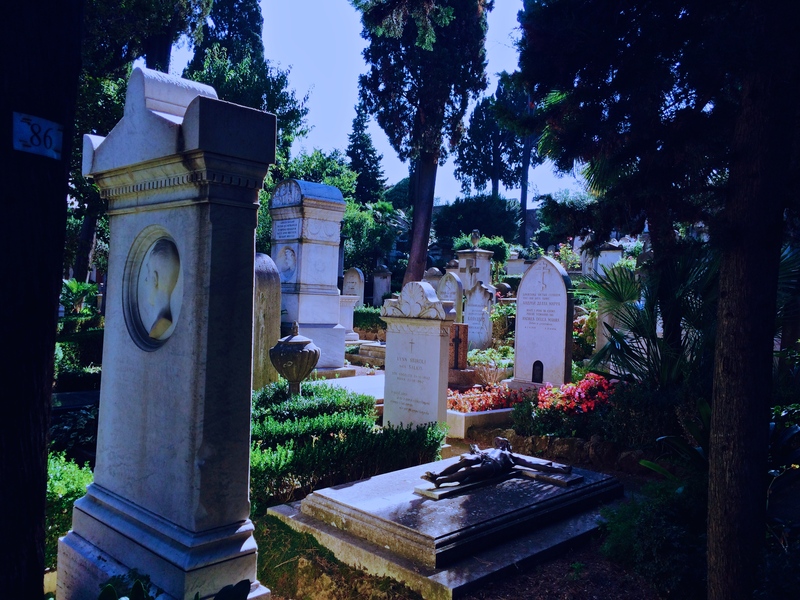 We have spent quite a bit of time in old cemeteries in southern Italy looking for family graves. We find them peaceful and fascinating places. 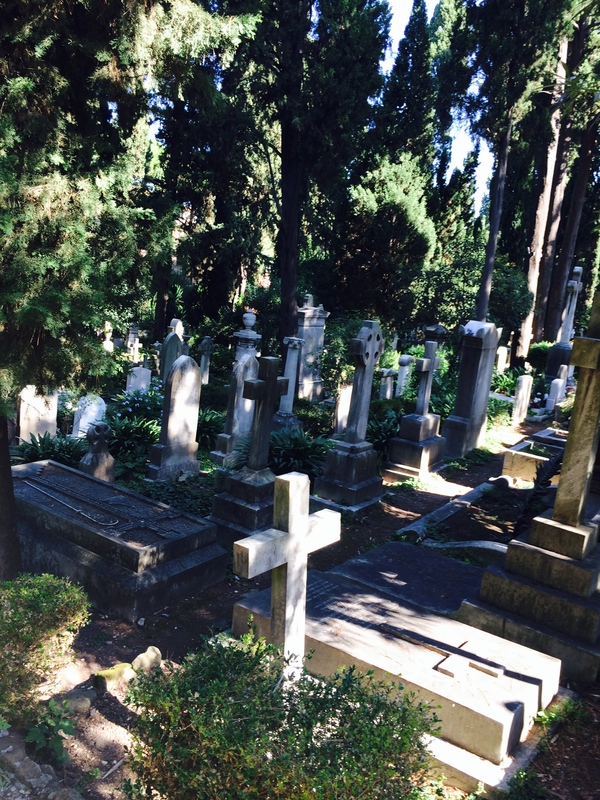 We have also visited cemeteries in other regions of Italy. The sculptures, the decorated graves, the old photos are so touching. What an amazing interesting experience and certainly something I would never think of doing. There are some fantastic scultures and tombs. Great photos. I particularly like the 1st one. The cemetery is a beautiful spot indeed and well worth a visit. But I think you’ll find that the pyramid of Cestius was built in about the year 13 BC, not the 13th century BC. I was a little worried by the headline since I don’t consider this cemetery creepy having visited it several times. But I soon stopped worrying. I can’t, of course, explain the strange picture, but it could be a cat. When I visited the cemetery three years ago, I talked to a woman in the information room. She gave me a flyer about the cats who live in the cemetery. They are called the guardians of the dead (or the departed). Sorry but I can’t remember which and would have to hunt through a file to find it. I will be visiting there again in a couple of months as I head to Rome in December. Hi Joan, good to hear from you again! yes, the title is a bit of a play on words. Granted, I would not want to be there in the dark, but during daylight hours it really is a lovely peaceful oasis. Thank you for stopping by and have a wonderful time in Rome! !